Apocalyptic Post - Ponderings of the Apocalypse: Got Raptured? I'll Walk your dog for you! 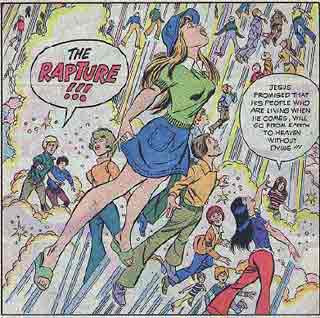 Those Rapture believin' foks in the USA, you gotta love 'em. Amongst the fervent believers there is that they will ascend to Heaven in the alloted time, leaving us pesky non-believers holding the bag... or in this case, holding the leash? In my last post on work, career coach Debbie Robins identified passion as a cure for human's instinctive fear of change. In this post, we'll meet a man whose passion led him to a second career in pet care for folks who believe they'll be going to heaven in the very near future when Jesus does His second coming. That's right: he's addressing believers' fear of being bad pet owners when the Rapture comes. Bart (he prefers to use his first name only for business) is a professional atheist. He writes about his non-belief, spends time on non-believer chatboards; has even written a book of essays about his debates with persons of faith. In a world of Jesus car fish, you could say Bart is a passionate "Dog is my co-pilot" bumpersticker kind of guy. And that's where his idea for his business began. He read about a service in the UK offering pet care for dogs and cats after the second coming of Jesus, a core tenet of the fundamentalist Christian faith. Bart didn't believe in Jesus - "or Baal, or Zeus." But before you could say, "Holy Big Bang, Batman! ", he had experienced (you should excuse the pun) an entrepreneurial conversion experience. In his previous life, Bart told me by phone, he'd been an executive for a major retail chain. Passion sold fashion. It's the foundation of faith and all kinds of loving relationships, too. If one believed that Jesus was on His way to your door with a one-way ticket to Eternal Life in His hand, this was exciting news for a passionate believer. But as a pet-owner, your soulless, if adorable Fido and Fluffy would be homeless when He called you home. Thank God for human sinners! In what I see as a riff (and maybe a schmidge of karmic payback?) for Jews enlisting "Shabbas Goys" to run their lights and such on the Sabbath, Bart decided to enlist atheists to serve the pets left behind by Raptured owners. He teamed up with his friend Brad, a web-savvy, athiest law enforcement offer he'd met online, and voila'! Rapture-believing Members will pay the service $110 for a first pet, and $15 for each additional pet. This money goes into a Paypal account. If the Rapture happens in the next 10 years, Bart and Brad's team of approved pet representatives will pick-up their pets from their now-owner-vacated home and bring them into their household forever...or until, you know. Needless to say, the first question on the site's FAQ section is, "Is this a joke?" Bart swears - or rather, asserts, that he's offering a service, based on his understanding of the French philosopher, Pascal. According to Pascal, per Bart, it's a wiser bet to believe in God than not to believe. If God doesn't exist, no harm; no faul. If He does, you're Saved. Earthbound Pets is simply abetting believers' bet. "It would be a scam if I offered the service and did not have the resources to deliver them if the Rapture came," Bart explained. But he does. And if you're a pet-loving atheist looking for a job, perhaps a job as a post-Rapture cat or dog nanny is for you. You'll need to have blasphemed against the Holy Spirit (dissing God the Father or Jesus the Son is bad, but not evil, apparently), be a pet-owner with a clean arrest record, and ideally, married. Pressed for a reason why married folks make better blasphemers, Bart admitted that singles of all orientations would be considered. That was a relief to me, personally. But on a deeper level - and in keeping with the focus of this series -- what really drew me to Bart's story, after its initial "say what?" factor was his passion, and his ability to realize it as work. In his first career as a retail executive, Bart said, he was well-compensated. But his job was to absorb the stress of a large corporation's profit motive. In his new enterprise, he finds job in the creativity of writing for his site and excitement in the task of creating a business model from scratch. If you look at the numbers, Earthbound Pets is doing well. "Less than a hundred" folks have signed up as clients in the last four days. Pet caregivers from 18 states have enrolled, and Bart claims to have another 800 applications to review. But in the end, his "strange"-sounding enterprise has a heart that transcends numbers. "I have two dogs, 13 and six," Bart says. "I don't know what would happen to them if I were gone." "I don't believe what they believe," he says about his customers. "But I don't object to their beliefs." By offering his customers a service the he himself values and would want, were he in their shoes, Bart has found a second career that means the world - if not the Afterlife - to him. Believe it -- or not. But in the end, a passionate atheist is selling -- and personally profiting from -- helping others find true peace of mind.